Acting on the recommendations of a study of the potential for major improvements in its busiest corridors, AC Transit moved to implement bus rapid transit (BRT) service in two corridors, International/Telegraph and San Pablo. These boulevards, among the busiest transit corridors in the San Francisco Bay Area, each connect a series of communities and major destinations including Downtown Oakland. In the San Pablo corridor, AC Transit introduced on-street rapid bus service in the early 2000s. In the International corridor, fully featured BRT operating in a median transitway is in final design and is scheduled to begin service in 2017. Over the last decade, Nelson\Nygaard has performed in multiple roles at multiple points on both projects. 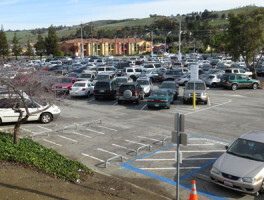 In the San Pablo corridor, we completed a comprehensive analysis of system performance before and after implementation. In the International corridor, we completed similar analysis for precursor rapid bus service before moving on to planning and design for the BRT project. 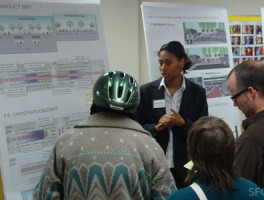 The latter included development of Locally Preferred Alternatives for Oakland and Berkeley, which required exhaustive outreach and included detailed design of the right-of-way, including both transit and pedestrian, bike and urban design elements; analysis and adjustment of stop locations; recommendations regarding transit-only lane design treatments and the design of stops; and production of an FTA-mandated Operations and Maintenance Plan. AC Transit, the bus operator for the East Bay, wanted to introduce faster, more reliable and higher capacity service in its busiest corridors. AC Transit implemented rapid bus service in the San Pablo corridor and is in final design in the International corridor. Share the post "East Bay Bus Rapid Transit"